In 1998, IMAX Corporation and the Royal Tyrrell Museum of Palaeontology joined forces. IMAX filmed its first fictional IMAX film at the museum—and it was about dinosaurs. Of course. One of the collateral projects that accompanied the film was a teacher’s resource guide. I worked with Sue Mander, from IMAX, and the Tyrrell’s education staff and researchers to produce text and activities for the guide. 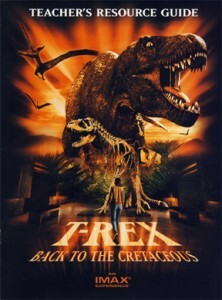 Click T.rex: Back to the Cretaceous teacher’s resource guide to access a PDF that samples the guide. Warning: this is a large file, and will take time to load.